There is NO shared space here, you will have your own private 2nd floor spacious apartment with a private deck. Most people are surprised when they see what they are getting for the price. It is very quiet and peaceful with a covered deck. There is a gas log stove in the living room and electric heat in the bedroom. This cabin is a perfect getaway for a couple or a small family. We provide cable TV and WiFi. There is a private entrance up the stairs. The master bedroom is huge with a large bathroom which includes a walk in shower and a jetted tub. The upstairs of this house is completely separate from the downstairs and very private. There is a full kitchen with pots, pans, dishes, and silverware if you want cook and a charcoal grill on the deck. The dining room has a table and 4 chairs and the living room offers a couch and love seat, and a recliner. There is a cable TV in the bedroom and a the living room. There is a DVD player if you want to rent movies while you are here. Relax on the deck with a good book or take advantage of the many activities...visit mile high grandfather mountain or go shopping at the outlet mall, or Bear Creek Traders nearby, followed by a nice dinner out in Boone. Mast General Store is worth a visit only 5 miles away with a large park next door for walking and playing. This house is near the Blue Ridge Parkway Price Lake entrance where there are dozens of trails nearby for viewing and walking ranging from strenuous to relaxing. In the winter this location is ideal for going to Sugar Mountain or Beech Mountain skiing. The wildlife in the area include deer, chipmonks, large fox squirrels, pilated woodpeckers, hummingbirds, cardinals, juncos, chickadees, sparrows, titmouses, robins, occasional finches and blue jays, you also may see deer, groudhogs, racoons, opossums, and wild turkeys. Small or well trained pets OK. I accept pay pal and checks in the mail and cash in person. You will have no regrets if you decide to rent this cabin. BEST WAY TO CONTACT ME IS TO CLICK 'CONTACT OWNER'. 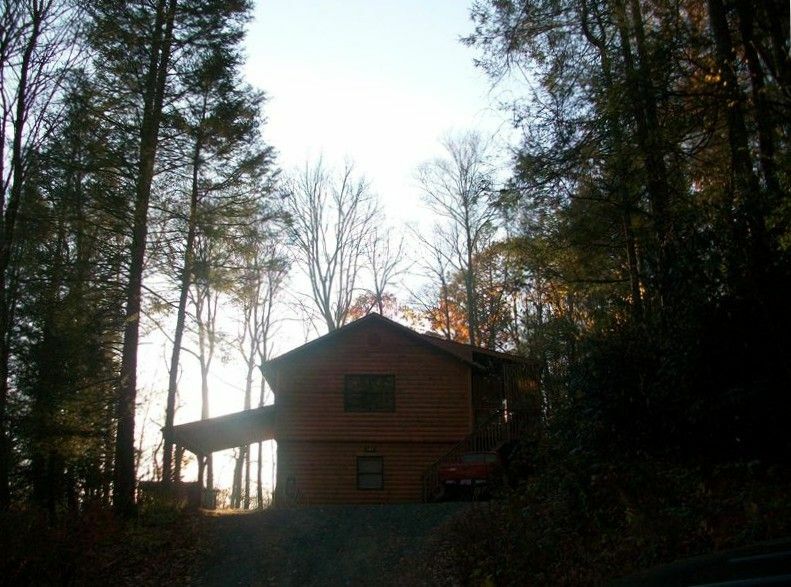 This house is perfectly located in between all of the great activities here between Boone and Grandfather Mountain and only 1/10th mile off the highway. This cabin is private with civilization right around the corner. Comfortable temperpedic mattress, WiFi, DVD, books, games, cabin decor, deck, color TV with cable in living and bedroom, many activities with 5-10 miles, flower garden, privacy. Only 5 miles from Boone city limits. Grandfather Mountain is clearly visible from the main road, 1/4 mile away. It's just a window unit and it works wonderfully if you close all the windows. We provide all sheets and towels. WiFi password is on the fridge. Fully equipped with pots, pans, dishes, microwave, coffee maker, dishwasher, and all major appliances. There is an island with a couple of bar stools as well as a dining table with 4 chairs . There is a selection of board games. Covered deck with a table and 2 chairs. Suitable for singles, couples, and small families with no pets. We loved this place! There were absolutely no negatives. The owner was tremendous. The cabin was spotless and in a great location. We will rent here again!! Our stay with Andrea was wonderful! She, as always, was a great host. From the welcome basket, the cookies, and to the many shared times together, she made us feel extremely welcomed!! The cabin was spotless! The accommodation had everything we wanted or needed. The kitchen was well-stocked, and if we needed anything, all we had to do was let her know and it would appear immediately. There were plenty of linens, with the sheets being very soft, and the towels being snow-white and fluffy. We would recommend staying here. The area is gorgeous, and this place was near everything. Nestled in between Boone, Banner Elk, Sugar Mtn., and Blowing Rock, it only takes moments to get to any of them. The Blue Ridge Parkway is close too! We had a great summer here! Thanks Andrea, for everything! What a charming place. Very quiet and peaceful but not far from anything you want to see or do. I knew the owner was within a phone call if I needed her, but otherwise no body around. I would recommend this to anyone looking for a quite place to stay and you could not beat the price. Very clean! We will definitely look at this again in the future. It is in the perfect location to visit all the High Country attractions and Blue Ridge Parkway. The cabin unit is immaculate, perfect sleeping mattress, and has all the amenities one needs for a great stay! We hope to return to the area soon and this will be our first choice for lodging for the two of us. Plenty of space, great location. We enjoyed a relaxing time at The Loft while celebrating our son's ASU graduation. Hope to return. Thank you Andie! Property located 1/10th mile off of Highway 105, 5 miles south of Boone and 5 miles north of Banner Elk. Please, absolutely no pets. Sorry, I have no choice.